�Nieudegat (local dialect for �Bird�s Nest) Gites� comprises six self-contained duplex apartments gites each with their own character, with its own swimming pool (shared used), set slightly elevated to enjoy views overlooking over 3 acres of private wooded grounds. Each of our six one bed self catering duplex apartments is ideal for two people and can sleep a maximum of 4 people if required. Cots and linen available for babies upto 1 yr at �20 per week. Grounds not suitable for toddlers and children under 8 years of age. Larger groups (max. 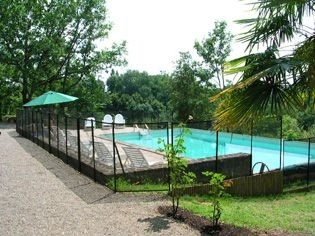 20) can be accommodated by booking gites en-bloc, ideal for family gatherings or clubs. 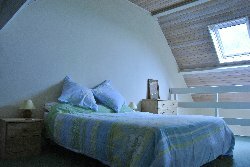 All Gites have recently been completely re-fitted with new furnishings, beds and equipment. 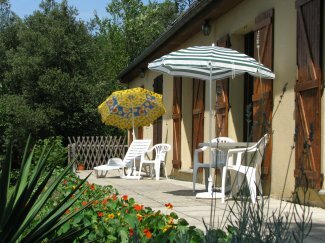 The gites have french windows opening from the living room onto a paved patio area overlooking the surrounding countryside where you can relax with a glass of wine and enjoy the peace and solitude. Each is fully equipped for your use and has a mini-cuisine with double electric hob, sink, fridge, microwave grill oven and cupboards. A constant supply of hot water is available. On the ground floor there is a spacious shower-room (one has a full-size bath) with hand basin in vanitory unit. Separate w.c. A built-in wardrobe. 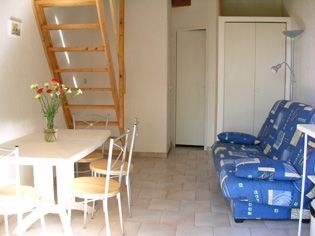 Linen and towels (excluding towels for swimming/sunbathing), and barbecues are all provided. Open tread staircase from the living room lead to the first floor bedroom (fully carpeted) with velux window. 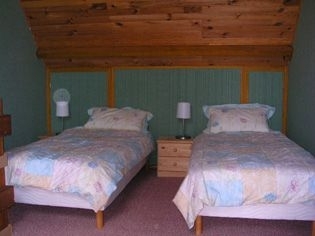 A choice of twin, double or super king size beds is available. 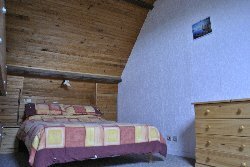 All gites have a double bed settee in the living room so that 3 to 4 people can be accommodated if required. Smoking is allowed in outside areas. Enjoy meals on the patio and dine while you watch the sun as it sets behind the trees. There is a boules area and you are welcome to explore the wooded grounds and identify a variety of birds, flowers and fauna. The swimming pool is 12m x 6m with a depth of 1 m each end and 2m in the middle. The pool and surrounding terrace are enclosed in a safety fence to comply with the latest French regulations. �Nieudegat Gites� are situated in the peaceful bourg of Simeyrols, 3 km from the pretty village of Carlux where you can obtain essential supplies of freshly baked bread (pain) from the bakers (boulangerie), cakes (gateaux) from the confectioners (patisserie), groceries (epicerie) from the general store (magasin) or Halle Paysanne (market selling local produce, open daily) and restaurant, meat (viande) from the butchers (boucherie), cafe/bar/restaurant and take in some local sight-seeing around the village. There is an ancient washing pond, church and part of the old castle wall. The town of Sarlat (Sarlat-la-Caneda) is 13 km to the west, with its bustling enormous Market, supermarket, shops, restaurants, bars, art galleries, church and cinema and late night disco, set in narrow medieval streets with restored Gothic and Renaissance town houses. The town of Souillac is 13 km to the east again with a market, shops, restaurants and historic buildings and the link to the N20 motorway. This is also en route to Rocamadour, the second most visited site in France and not to be missed. La Roc Gageac, the third most visited site in France is only 20 minutes away by car, with its fascinating cave dwellings and views over the Dordogne valley. 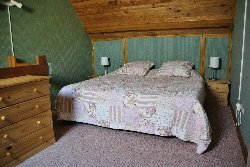 Prices are based on a maximum of 4 people per gite.